How fun is it to surprise your tiny ones with cute, festive treats that make their little eyes sparkle and their tiny hearts feel special? I love love love to get creative in the kitchen and see their smiles when they come to the table and find something fun and inviting for a weekend brunch. These little jewels are perfect for cold Saturday mornings by the fire, and the house smells divine after you bake them! 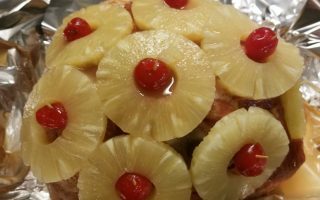 The base recipe can be found in this post from Christmas, but the method and results are the same. 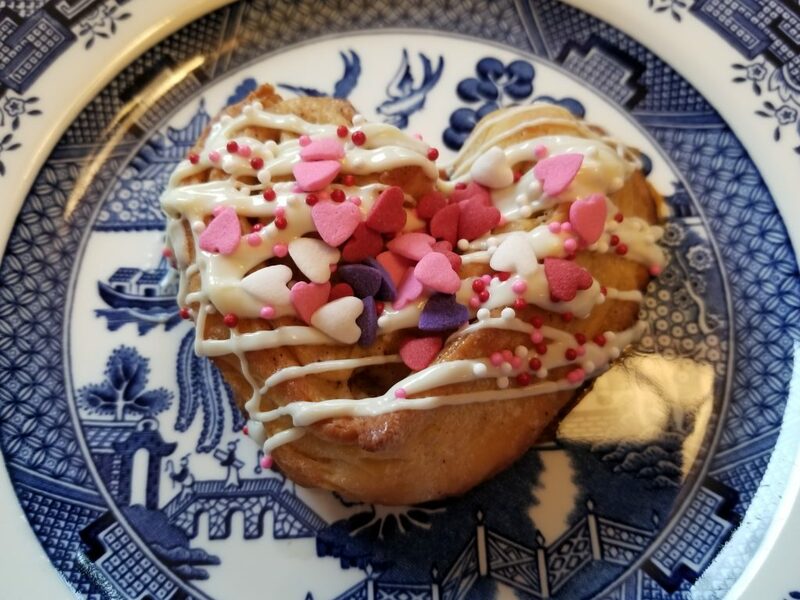 I love this recipe because the cinnamon rolls are made the night before, allowed to rise, rolled out, and then rise again before you put them in the fridge. 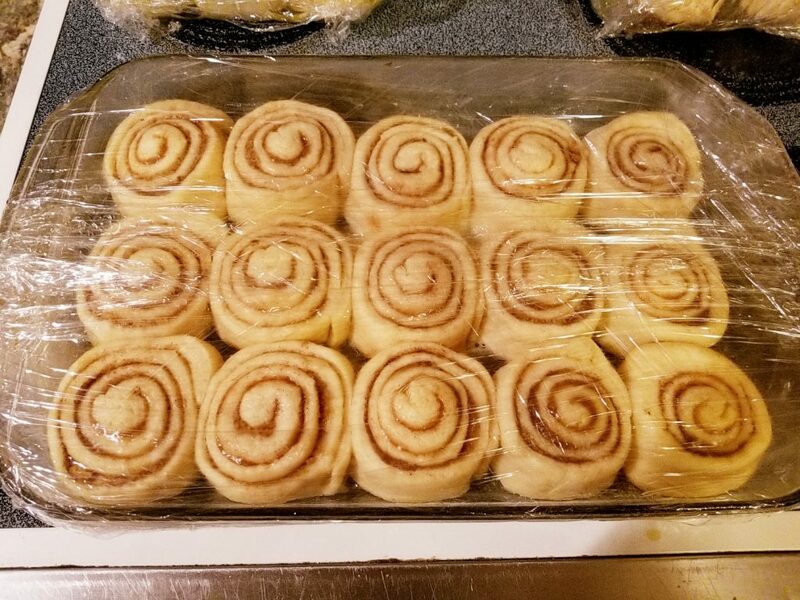 If you wrap them tightly, your family will think you have been up all night, or at least since the wee hours, making cinnamon rolls from scratch just for them. 2 tablespoons ground cinnamon – I use much more! To make these cinnamony little gems place yeast, sugar, milk and butter in a microwave safe dish and warm for 1 minute. Place these ingredients into the bowl of a stand mixer fitted with a dough hook and mix on low until ingredients are combined. Add eggs. Slowly add flour until the dough forms a sticky ball around your dough hook and pulls away from the sides. 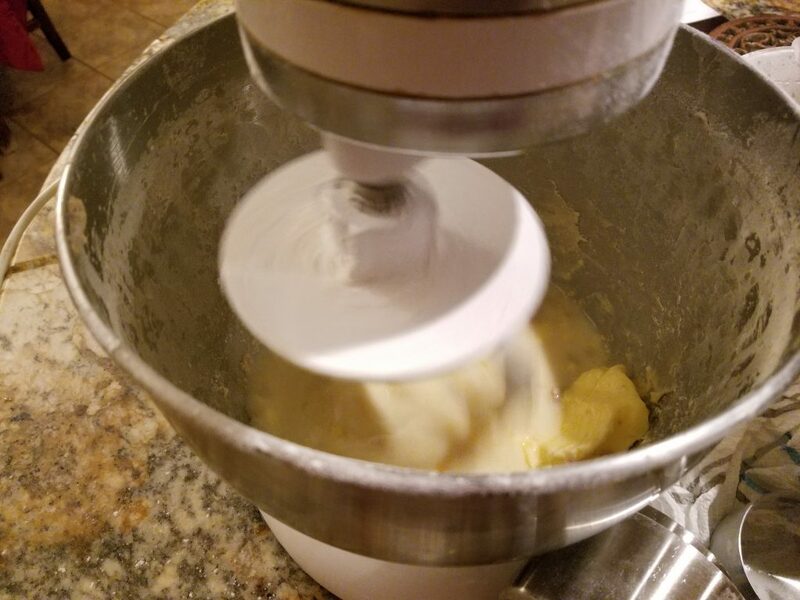 The original recipe I used called for 3 cups of flour, but I found that the dough was still too wet with only 3 cups – I used closer to four in each batch. Lightly grease a large glass or metal bowl and turn dough into the bowl to rise. Cover very tightly in plastic wrap and put into a warm place to rise. I like to turn my oven on to 200 degrees before I begin making the dough. Once it gets to temp, turn the oven off. This is a dark, warm,perfect environment to promote your yeast to activate and dough to rise really well. Leave it alone for about an hour =it should double in size before you begin the next step. 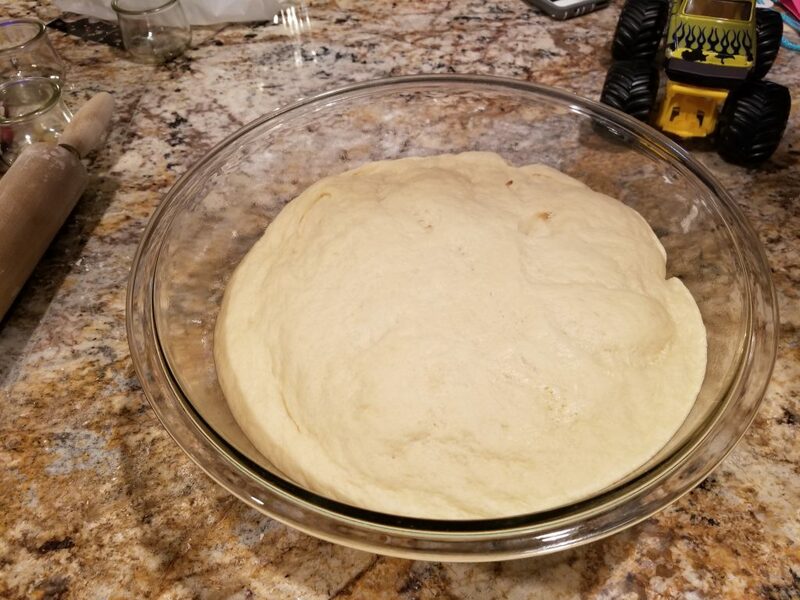 When your dough has made its 1st rise, remove it from the oven and punch it down. 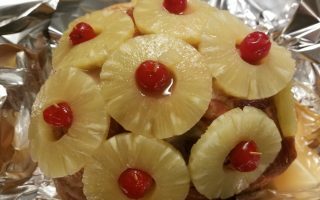 Just stick your fingers directly into the dough and watch it deflate like a balloon. This is normal – don’t worry! Turn it out onto a floured surface. 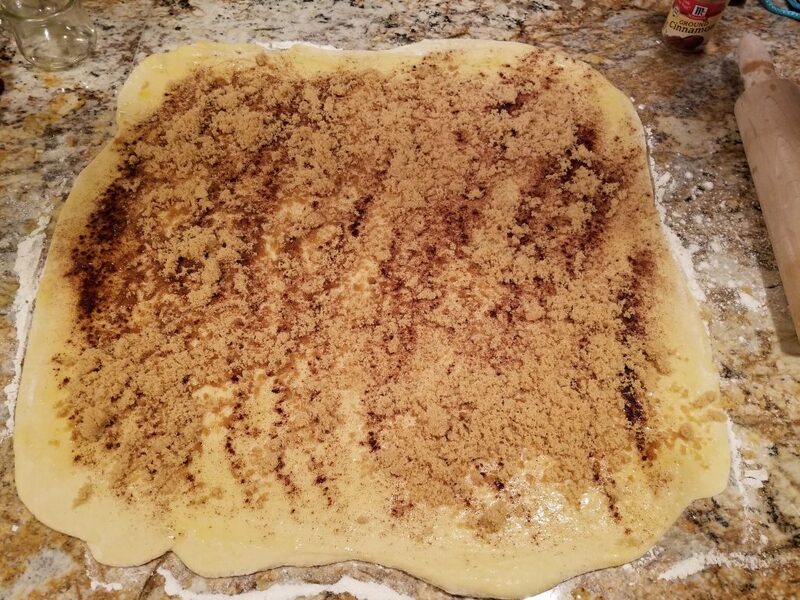 Roll your dough into a 12 X18 rectangle and brush melted butter over the entire surface. Sprinkle with cinnamon generously and then with your brown sugar. Roll your rectangle into a roll and cut into slices. I gently use a serrated knife to cut through,but you could also use thread or unflavored floss. 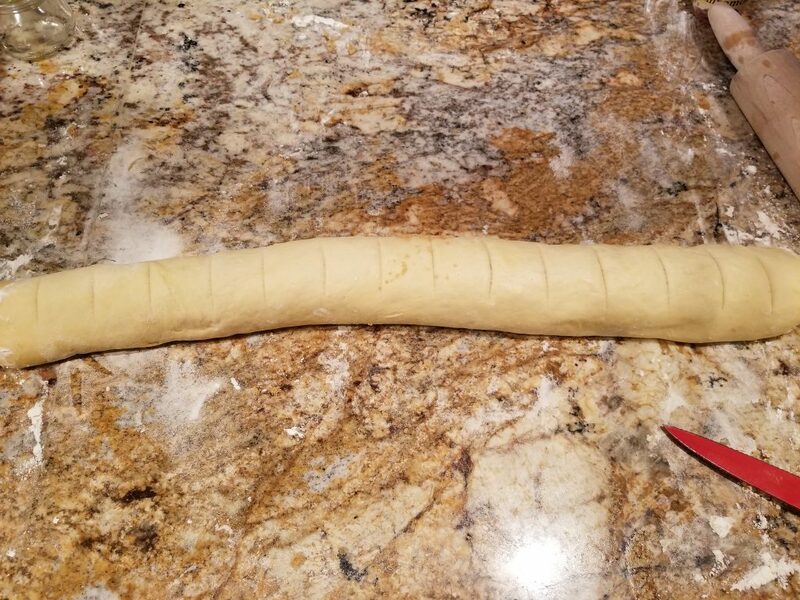 I would not recommend using a straight edge knife as it will put a lot of pressure on the edges of the dough where you cut,and could make your rolls pointy on the ends. Nobody wants a cinnamon rhombus. 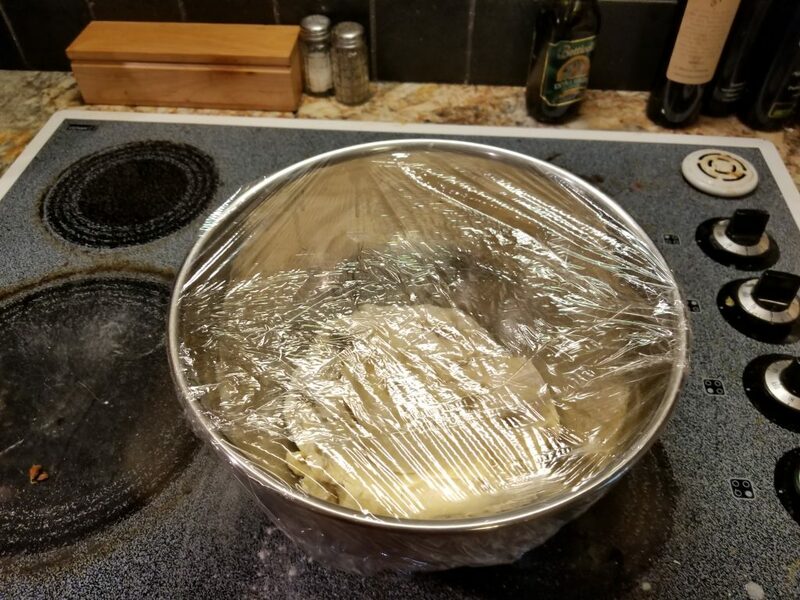 Evenly space your rolls in a heavily sprayed pan, giving them room for their second rise as you place them. Leave a little “elbow” room between them. This is the point at which you can freeze, place in the fridge to proof overnight, or just let them hang out for another hour and bake immediately. If you are freezing or overnighting, wrap the rolls very tightly, leaving no exposure to air at all. The air will dry out the bread anywhere that it is allowed to reach and give you dry and crusty bits on your rolls. Again, nobody wants that. Bake at 325 for about 20 minutes. To roll out the cinnamon rolls, follow the regular instructions. 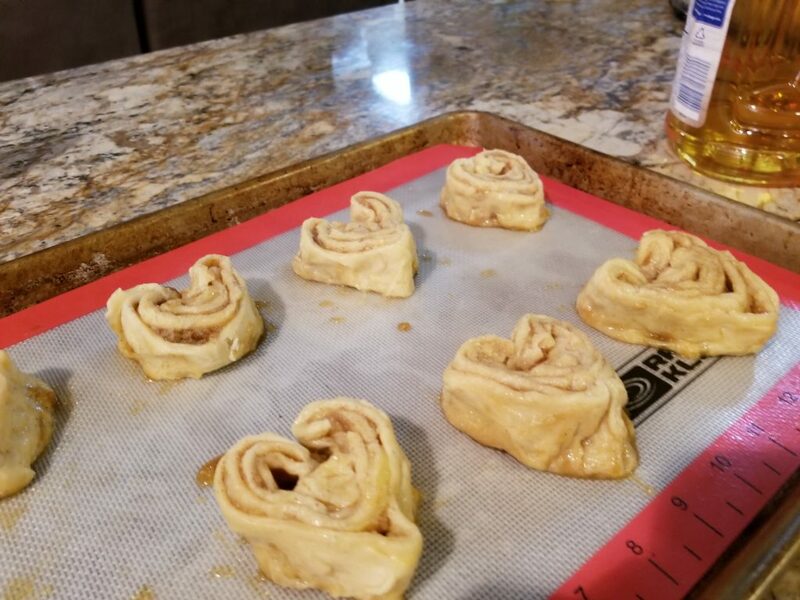 To shape them, make an indention in the center of the top of the roll, then pinch and elongate the bottom so that you have a lovely heart shape to bake. Bake the rolls in their heart shapes, they will puff up a bit until they are golden brown. Glaze with a simple confectioners sugar, vanilla and milk glaze rather than the cream cheese one in the linked recipe. Then drizzle over warm rolls. Add sprinkles and candy hearts for garnish. These are so fun! 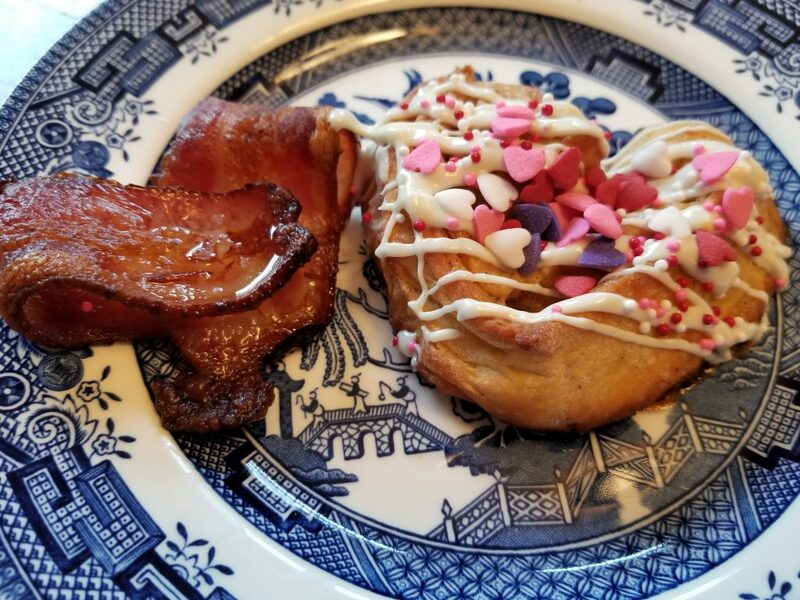 I especially love the heart shaped bacon. These are super easy to shape and since you bake them at 400 degrees for about 20 minutes, there are no splatters to burn your fingers. Papa Bear likes it best when I express my creativity in bacon. 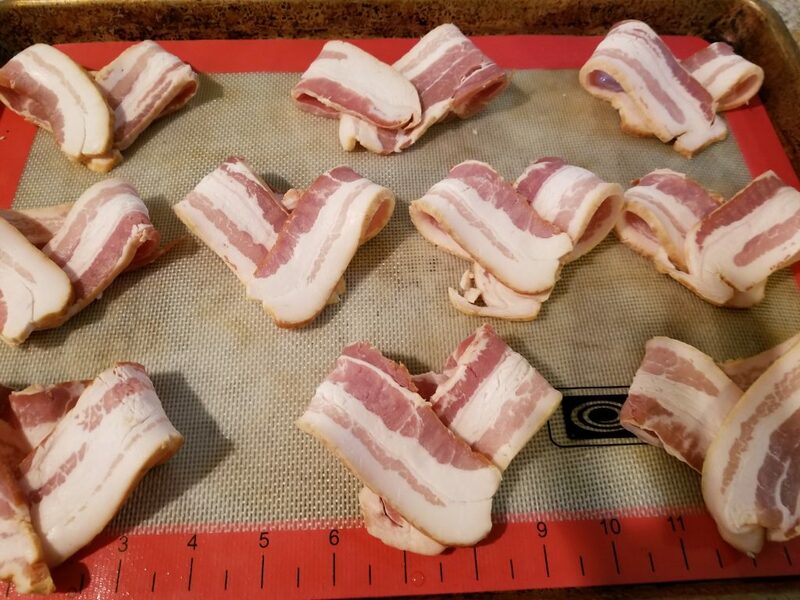 Simply bring the ends of each length of bacon to the center and shape into a heart form on your baking pan. Then pop into the oven to crisp. 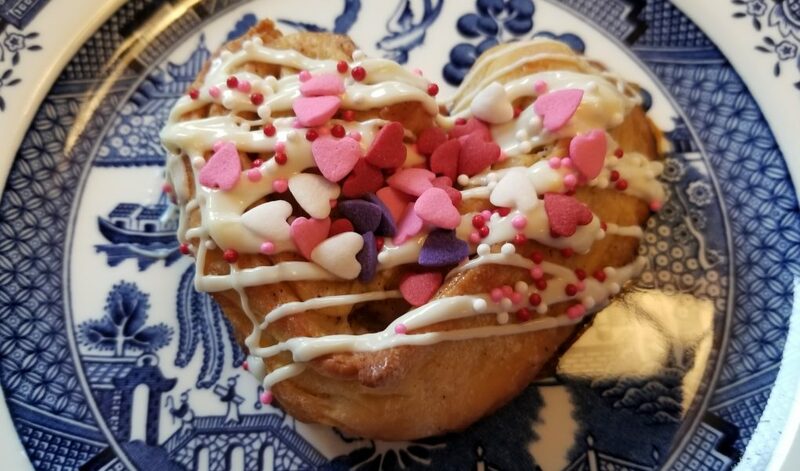 This easy and delicious Valentine’s brunch was perfect for my little brood, and made their rainy Saturday morning a little more special. Though it’s a lot of sugar, it would pair well with the perfect hot cocoa and cocoa toppers! 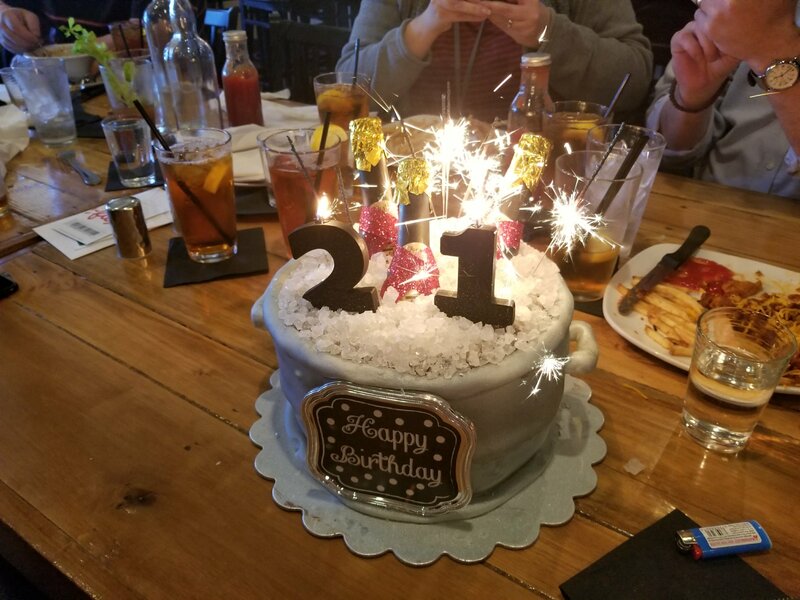 What are your favorite brunch must haves? The kids think I am silly, but they love it!